Japan’s world class department stores carry a similar range of products to their Western counterparts. The top floors usually have a selection of international restaurants, while bustling food markets in the basement floors are filled with beautiful selections of sweets and savory delicacies. During Japan’s traditional business gift seasons in summer and winter, department stores sell branded food and drink gift boxes for delivery. Gift vouchers are also common. 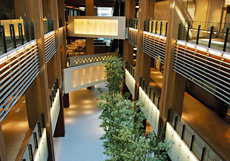 Shinjuku, Ginza and Nihonbashi contain the greatest concentration of department stores in Tokyo. Japan’s spacious shopping complexes contain hundreds of stores including Japanese and international food, fashion brands and variety stores. Some complexes have seasonal events and installations – for example, Tokyo Midtown in Roppongi has a skating rink in winter while art displays and science fairs take place at other times. Supermarkets in Japan vary widely in both size and the range of goods on offer. Larger supermarkets are more common in residential areas and may sell clothing and homewares in addition to groceries. Smaller supermarkets typically sell only food items – toiletries and other everyday goods may instead be found at drug stores (see below). 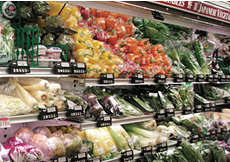 While special offers are not common in Japan, many supermarkets have weekly or monthly discount days where particular items, such as fruit and vegetables, are slightly cheaper. Because of wide price differences between supermarkets on different items, money-conscious households often frequent several different stores to get the best value. Supermarkets are open 7 days a week, most days of the year, with some open 24 hours a day. 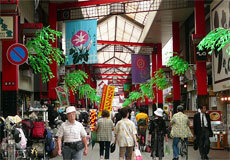 Shopping arcades (商店街, shōtengai) are shopping streets found in neighborhoods all around Japan. Often made up of privately owned local shops, cafes and restaurants, they can be pleasant places to shop at a more relaxed pace, and find items that typical department stores may not carry. 24 hour convenience stores, known as konbini in Japanese, are everywhere in Japan. Konbini offer a lifeline in rural areas where supermarkets may be further away and close earlier than in cities. Drinks (including alcohol), snacks, magazines, and pre-packaged meals are the staple of these stores, and supplies including basic clothing, stationery, and umbrellas are also available. Most convenience stores have　printers/copiers and bank ATMs, as well as multimedia kiosks where you can buy tickets for concerts, make travel reservations, pay for goods bought online and much more. They also handle postal/courier services and payments for utility/phone bills, tax and pensions. Drug stores in Japan carry daily items including cosmetics, toiletries, cleaning supplies, snacks and non-prescription drugs (prescription drugs are also available depending on the store). Medicines are more strictly controlled in Japan than in many western countries, so you may find it difficult to find stronger drugs without a prescription. Some clinics have their own dispensaries while others will refer you to a nearby yakkyoku (薬局, pharmacy). Book stores in Japan have differing rules regarding the arrangement of books in the store. Some stores arrange fiction books first according to publisher rather than genre. At larger chains, such as Kinokuniya, you may find a help terminal that will allow you to locate the book you are looking for according to floor and shelf number. These stores often also have a floor dedicated to foreign books and magazines. Budget shopping can be a lot of fun, offering the chance to find rare or unique items, and you may be surprised at the range of items that can be bought cheaply in Japan. The products offered at large-scale discount stores like Don Quijote range from daily items, toys, foods and home appliances to jewelry and luxury brand items. The range of items offered at these stores is astonishing, from food, stationery and clothing to toys, homewares and gardening equipment. All items are priced at ¥100 plus tax unless otherwise stated. Recycle shops buy and sell quality used goods, often limiting their selections to items less than 5 years old. Shops selling appliances and furniture are common, as are those specialising in used books, DVDs/Blu-rays and games. Known as furugiya (古着屋) in Japanese, second hand clothes stores range from casual and street fashion specialists to those that carry only high-class brands. Kinken (金券) shops buy unwanted tickets and gift vouchers and sell them at a cheaper price than the original cost. Gift vouchers for department stores are usually in stock, and you may find it possible to get a cheap cinema, concert or amusement park ticket. Many wholesale (問屋, tonya) chains have stores where individual customers can shop. In Tokyo, these stores are concentrated mainly around the Shitamachi areas such as Asakusa, Ueno/Okachi-machi, Nihombashi, and Asakusabashi. An impressive variety of goods including food, kitchen supplies, plastic food replicas, daily items, toys, snacks, tools, fireworks, etc. for both home and professional use are available at discount prices. The stores have great expertise in their products and can help you with your shopping. Below is a list of some of the main tonya areas. Nihombashi – close to Bakurocho and Higashi-Nihombashi stations is a wholesale street specialising in clothing. Kappabashi – an area between Ueno and Asakusa selling everything for the restaurant industry including many kitchen items available to all. Nippori – a wholesale fabric street is located to the west of Nippori Station. Okachimachi – Tokyo’s jewellery town, to the south-east of Okachimachi Station. Hanakawado – located to the east of Sensoji Temple in Asakusa, this area is dedicated to shoes. Asakusabashi – the stretch of Edo-dori between Asakusabashi and Kuramae includes wholesale shops for toys, handicrafts and stationery. In addition to a variety of global Internet shopping sites, there are a number of services within Japan that offer convenient online shopping services in English. Imported organic foods, books and more. Imported groceries and general merchandise.